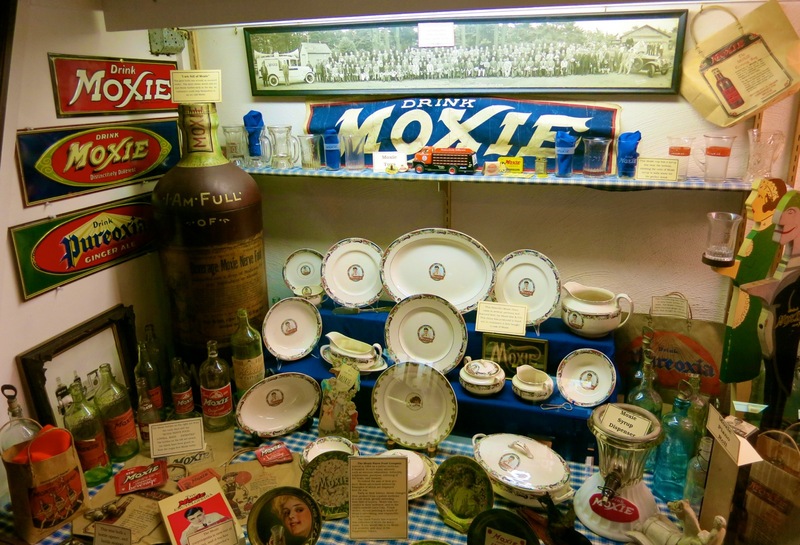 VISIT: Clark’s Trading Post, Lincoln. Yes, Clark’s sells over 10,000 lbs of fudge per year, but this complex is so much more than a gift shop. Plan on two hours or more to get an overview – more if you are a nostalgic type (or have kids in tow). First opened in 1928 and now run by it’s fifth generation, Clarks began as an Eskimo Sled Dog Show and Souvenir Shop, and has morphed into a Bear and Chinese Acrobat Show and Theme Park, with a brick Main Street that seems straight out of The Truman Show. 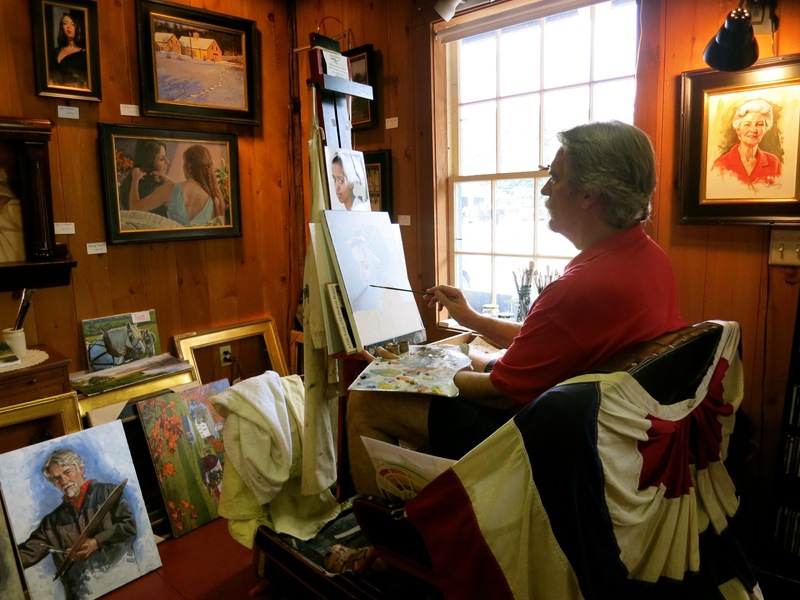 The Clark family has a tendency to import facades and whole structures (like a 120 ft. long, 30 ft high Covered Bridge) from other New England towns, and its museums are stocked with Americana sure to trigger nostalgia in many a boomer. 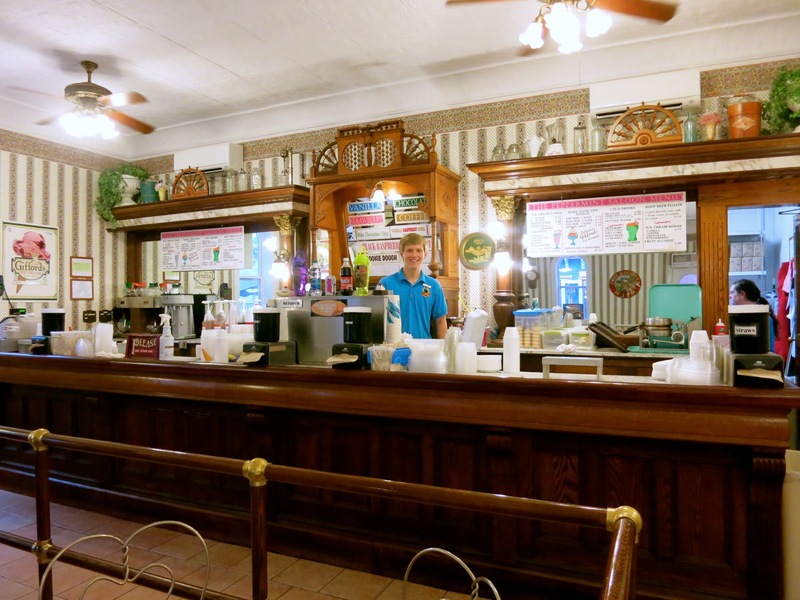 The counter at the Old Fashioned Ice Cream Parlor came from Jack Sharkey’s Bar in Boston, and you’ll find a whole exhibit on Moxie Soda (ne, Tonic). Avery’s Garage features an authentic “Moxie Mobile,” complete with fiberglass horse. You can ride a steam train, scale a climbing wall, ride Segways and bumper boats, make your own candles, stuff your own toy (like Build a Bear, but cheaper), and of course shop. 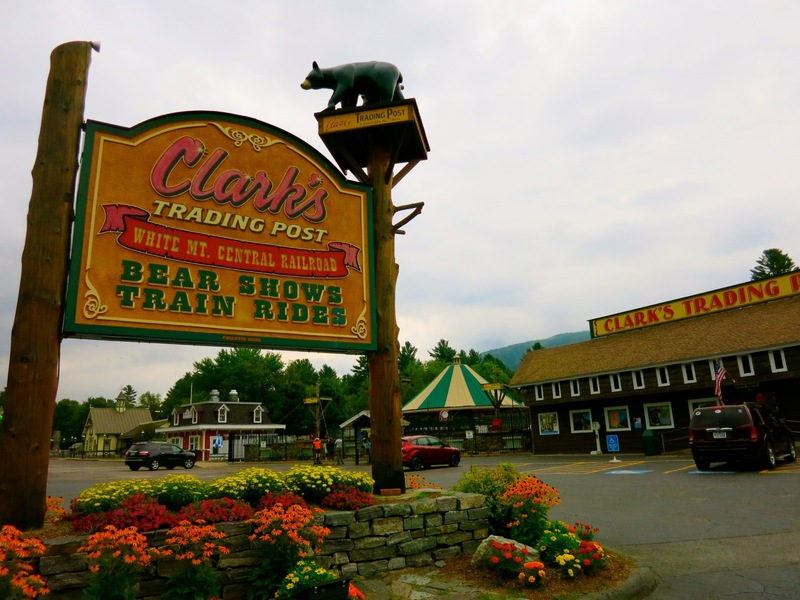 But the reason most people visit Clark’s is for the Bear Show. Maureen Clark is the head bear trainer, and deems it a “privilege to work with them.” Right now, there are seven performing Black Bears – some were abandoned, some orphaned, some born here. They begin instruction early, and Maureen can tell the difference between “showman” and shy. Training is compassionate and respectful of the bears. “We don’t use whips, sticks or threatening devices,” she says. “What we do have are spoons and treats.” And though they seem domesticated, the bears are wild animals. “They still have all of their teeth and claws.” Respect, indeed. 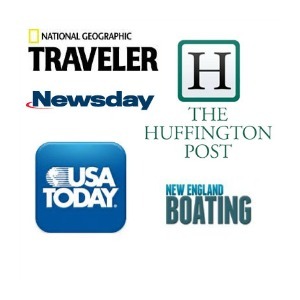 Open May – Oct (check website for times), $20 per person for all shows and activities. 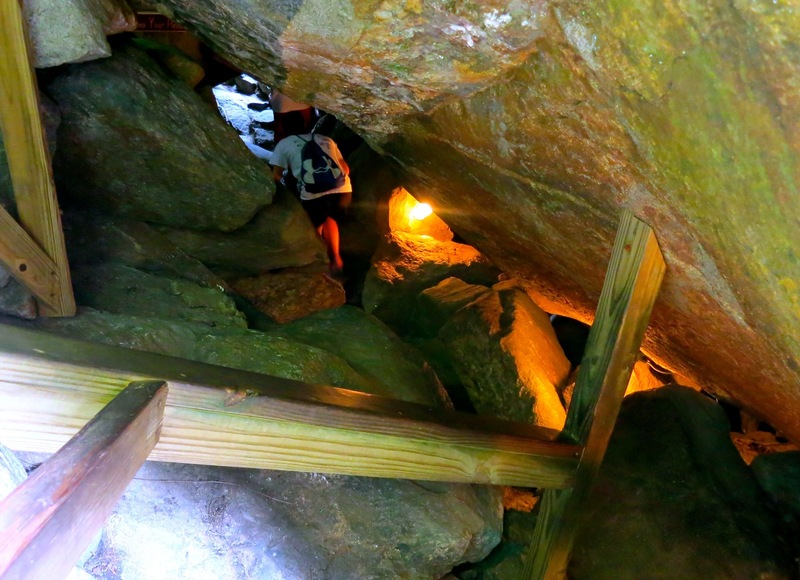 VISIT: Polar Caves Park, Rumney (about 14 miles from Squam Lake). Whenever the word “Fudge” shows up on a tourist attraction street sign, I generally run the other way. But good thing I didn’t – because once you get past the fudge, the trinkets in the souvenir shop, the Gold-Panning, the Thai pheasants chasing each other in small cages, the petting zoo and duck pond, you get to what you REALLY came for: The Polar Caves. 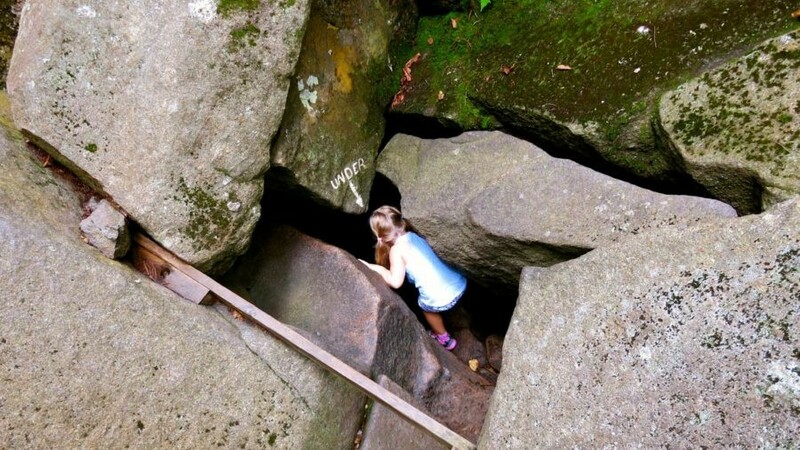 Don’t expect caverns with stalagmites and stalactites: These series of haphazard boulders that seemed to have fallen hundreds of feet off the adjacent granite cliff (but are actually remnants from the last glacier) are arranged in such a way as to create the nooks and crannies perfect for squeezing through, up and around. Though it helps to be a contortionist (or a kid) to get through some of these dozen passages that exhale cool air throughout the year (thus the name), parents and even grandparents in good shape love it, too. Daily 10-5 May – Mid Oct, $16.50 adults, $11.50 kids. 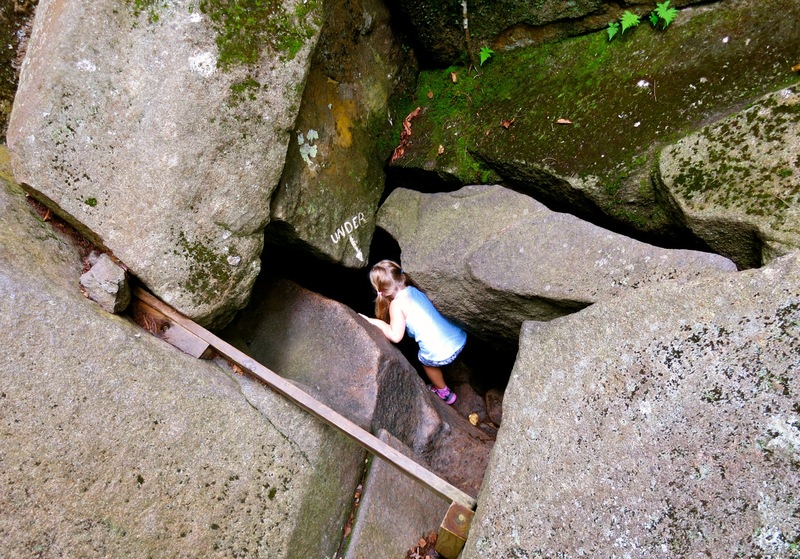 TOUR: Lost River Gorge and Boulder Caves, N. Woodstock. 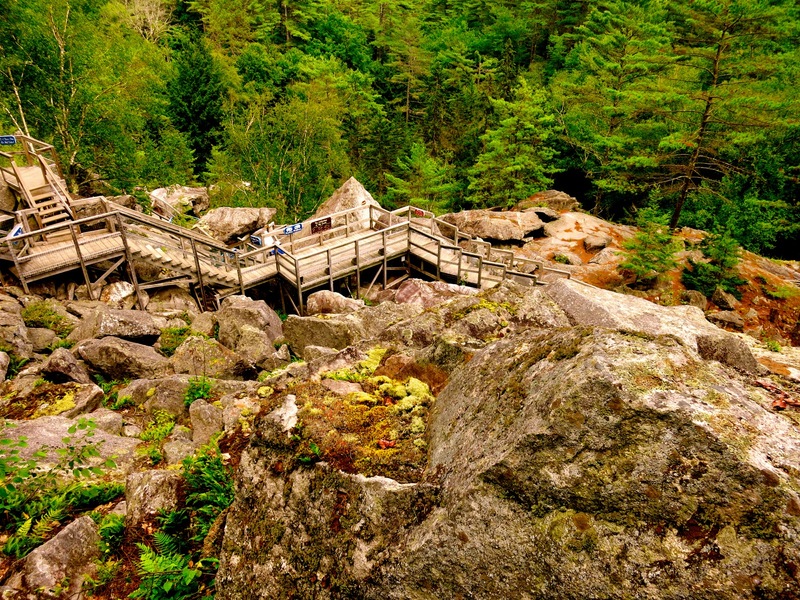 Combining elements of The Flume and Polar Caves, this attraction’s claim to fame is its intricately designed and wrought wooden stairways and boardwalks that weave in and around boulder caves throughout a narrow gorge. In many cases, you’ll hear the river, but not see it, hence the “Lost River” moniker. A fun way to get your dose of exercise and nature. Early May to Mid Oct, 9-6, $18 adults, $14 kids. VISIT: Bath NH. This tiny town is home to several terrific spots including “America’s Oldest General Store” – the 1790 Brick Store, with wide planked sloping porch, a cute outhouse-style smoker emitting the delightfully pungent odor of smoking meats and fish, and a whole array of quirky, trendy “down-home” products including ‘Bacon Fudge Pops” for $2.59, and Brick Store brand sodas. 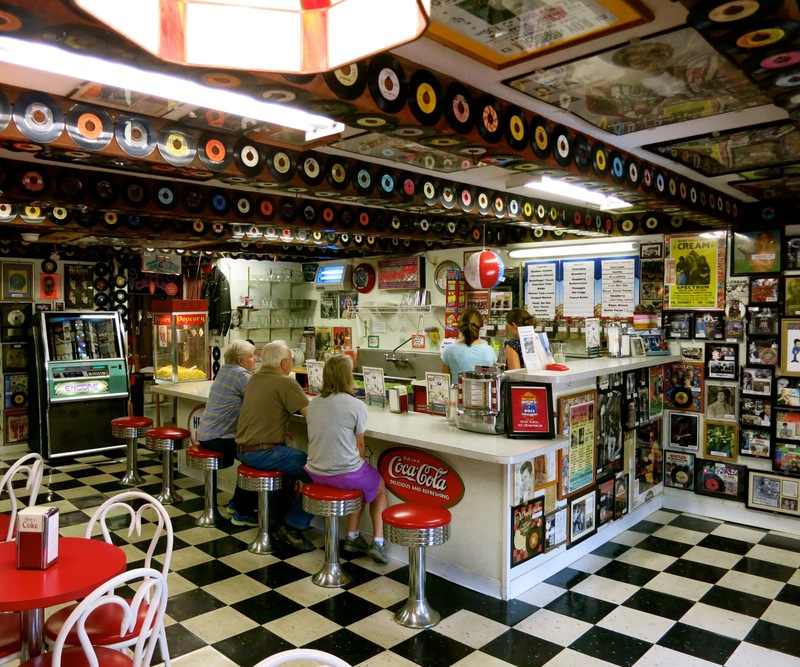 Next door, though At The Hop 50’s Ice Cream Shop sells commercially made Hershey’s Ice Cream, the décor is absolutely one of a kind. Walk in just to see every inch of wall and ceiling blanketed with 45’s, posters and other memorabilia. 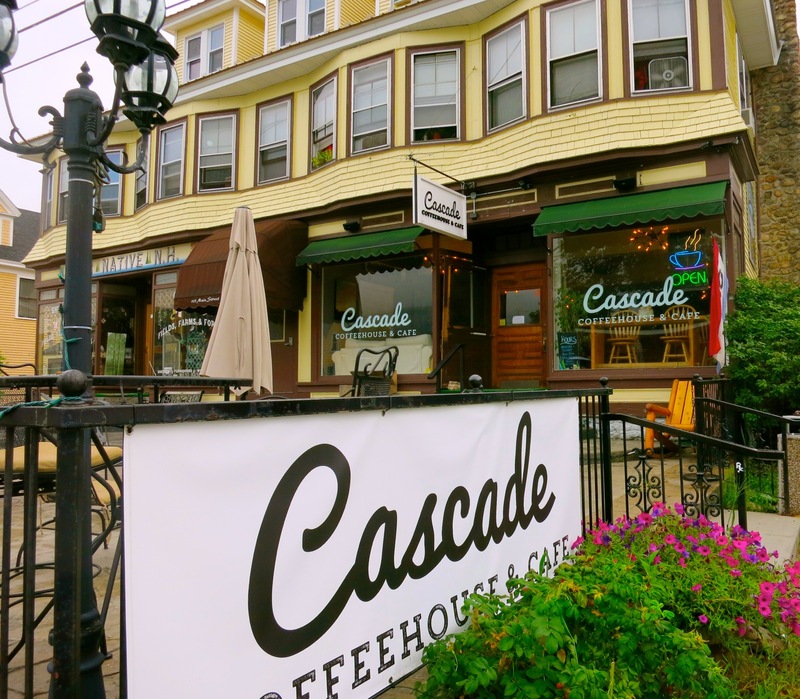 COFFEE/PICNIC: Cascade Coffee Shop, N. Woodstock. Just a couple of miles from Clark’s Trading Post, this urban-style deli is the best for artisanal coffees, meals in a bowl, sandwiches and wraps. Order a sandwich to go. EAT/LUNCH: Windy Ridge Orchard and Cider Mill Café/ 7 Birches Winery, North Haverhill. 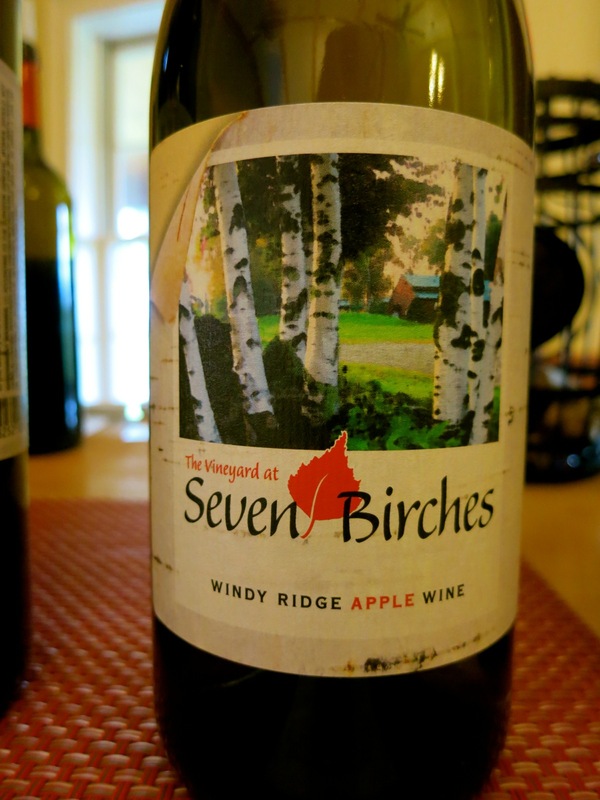 Far from town, this windy hilltop spot, formerly just an apple orchard, now features a great lunch Café and tasting room for homemade Apple and Blueberry Wines (under the 7 Birches name). A family destination as well (with outdoor playground), you can munch on great donuts, pick your own apples and blueberries, taste fruity and more traditional wines in a lovely Craig Pursley Art Gallery/7 Birches Winery Tasting Room, and pick up apples ($6.50 half peck), wine, honey, books, homemade peanut butter and local crafts in the gift shop. Café open June 15-Labor Day, Gift Shop open till Dec. when Windy Ridge turns into a Christmas Tree Farm. STAY: Waterville Valley (See This Review).